In a bid to gain perspective on what education professionals at international schools in Japan are doing to provide global education to their students, Savvy Tokyo reached out to Laurus International School of Science — currently, the only international science school in Japan. Here is what they had to say. STEM, ICT, and programming are what really separates us from other schools. All our K3 students take these classes as well as an incredibly solid curriculum foundation of English, Math and Social Studies from the Cambridge International Curriculum. We also have art, music, karate, and capoeira classes developed by our specialist in-house curriculum team. Everything we do is global in terms of our vision and school philosophy. However, if we had to highlight one area, it would probably be our STEM classes. STEM is all about problem-solving — and this often means global issues or human issues. The problem to be solved could be clean drinking water, land erosion or renewable energy — the answers affect us all. In our classes, we use programming, 3D printers, VR and Augmented Reality, Z Space, tablets, PCs, 3D projections — whatever the lesson requires. We also use good old fashioned pen and paper, of course. It is our job to prepare children for a future with technology that does not yet exist, jobs that have not been created. We do this by placing the key emphasis on problem-solving and inquiry-based learning. Our school now collaborates with quality organizations around the world, including international schools in the Middle East, HKPMA and Foundation Global from Hong Kong, and schools in England and soon New York. For example, our Grade 2 class are in a letter exchange (pen pal) with the former school in the UK of our Assistant Principal. Our K3 are in a STEM exchange with schools in Dubai with our STEM specialists. There are so many examples, but one more, for now, is our Science Fair open to everyone in and around Tokyo. This year, over 1000 people came to our school in Shirokanedai. 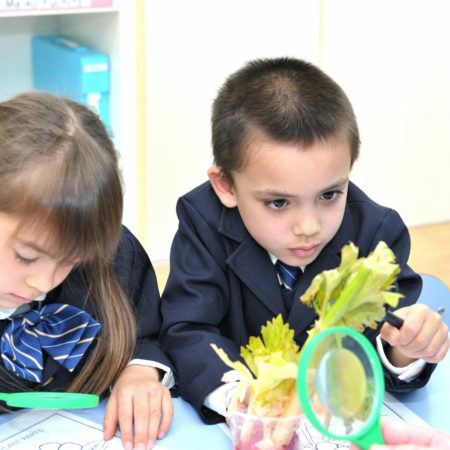 We encourage all children to use their own natural sense of inquiry. It is our job to prepare children for a future with technology that does not yet exist, jobs that have not been created. We do this by placing the key emphasis on problem-solving and inquiry-based learning. We teach children HOW to learn. Learning and remembering are totally different things. Combine this with a strong sense of friendship, community, and compassion and you are creating the next generation of global leaders. We look at each child as unique and all with skills and talents that can be identified, supported and then unleashed. Our school has STEM classes which are becoming more and more recognized around the world. Through our lessons, students become great problem solvers. When you combine this with critical thinking skills and collaboration — which are key points of our school philosophy — you provide students with the perfect base to become future innovators. Once students are thus empowered, we become facilitators — we look at each child as unique and all with skills and talents that can be identified, supported and then unleashed. To learn more about Laurus International School of Science, see here.